Sensitivities to a wide variety of scents do vary, and we are often not aware of scents on clothing we are ourselves wearing — remember that these scents can linger on garments. The nature of our sport is that it requires close proximity and contact with others to work well, so please be particularly aware of this if you use scented products, or if you are a smoker. If possible, take the time to change to recently laundered clothes before you come dancing. And remember that good personal and oral hygiene is a simple way to show respect for other dancers. The Victoria Ballroom Dance Society is a social club — this is one of the considerable benefits we bring to both ballroom instruction and our events. Asking different people to dance is encouraged. Either the gentleman or the lady may ask for a dance. This not only strengthens the social dimensions of the club, by allowing members to meet others (something that is an important part of the mandate and purpose of the Society, and very important in a volunteer-based organization like VBDS), it also increases comfort and confidence in dancing with multiple partners, and for some dancers, affords important opportunity to strengthen Lead or Follow dance skills. 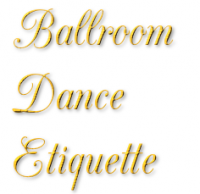 Dance etiquette requires that one should avoid declining a dance under most circumstances. If one does not feel comfortable doing a particular dance, it is a good idea to offer to partner for a subsequent dance in its place. There is no correct way of refusing an invitation on the basis of preferring to dance with someone else. According to tradition, the only graceful way of declining a dance is either (a) you do not know the dance, (b) you need to take a rest, or (c) you have promised the dance to someone else. Also, declining a dance means sitting out the whole song. It is most inconsiderate to dance a song with anyone after you have declined to dance it with someone else. If, on the other hand, someone makes inappropriate advances or remarks, you are within the bounds of etiquette to politely but firmly decline any more dances. All dancers are encouraged to show respect at all time for other dancers. Please find us on Facebook at Victoria Ballroom Dance Society – Like, Enjoy and Support VBDS with all of your comments, likes and by sharing your favourite pictures with others that have a passion for Ballroom Dancing….This will help to Increase awareness of VBDS in Victoria! !